Himalayan Salt Lamps have a soothing, calming light and they work perfectly for your baby’ room or nursery. There are also many that swear by the health benefits as well. This light omits a warm pinkish or orange glow, much like a sunset. You may also enjoy a Himalayan Salt Lamp when you have to get up in the middle of the night. I have the little little night lights in my hall and bathroom. I don’t want to turn on the overhead light just to pee. I don’t know about you, but I find bright full light in the middle of the night quite assaulting and studies show that exposure to bright lights at bedtime can interfere with your sleep. I would not want to get up for feedings in the middle of the night to have white light in my eyes. Though your baby can’t talk or articulate this, I am sure bright white light is assaulting to her a well and may make going back to sleep more of a struggle. Are Salt Lamps Safe for My Baby? Yes, Himalayan Salt lamps are perfectly safe for your baby, providing they aren’t licking them. This is highly unlikely. A few years back there was a major recall on one particular Himalayan Salt Lamp. It was sold at Michaels and was of poor quality from a cheap manufacture. It was in the wiring. Not all salt lamps are of high quality. Some Himalayan Salt Lamps are flat out fakes. 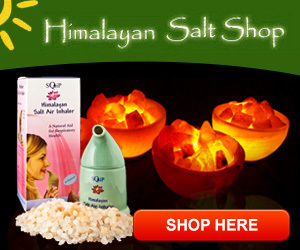 This is why it is really important to buy your Himalayan Salt lamps from an authentic and reliable source. I have bought all of mine at the Himalayan Salt Shop. Will Salt Lamps Bring Health Benefits to Baby? This is a widely debatable topic. It’s a fact that Himalayan Salt does produce negative ions. They are claimed to improve the quality of air in your home. Does it produce enough to matter? Research is still being done in this area. Negative ions are what is in the air when you are at the beach or on your front porch during a thunderstorm. You can’t see it, but you feel the calming properties. This is why we are more relaxed on a beach or near a waterfall perhaps. Our day to day lives are full of items that produce positive ions. Things like tv, cell phones, laptops and appliances. We do know that this kind of energy is not good for us and can in fact mess with our sleep. I am pretty sure a little night light, although the glow is wonderful, will not produce enough negative ions to make much difference. I would get one bigger. You need to get the right size for your room. They are beautiful and soothing. They give off a warm calming light and may even have some health benefits as well. You will love them just as much as your baby.